Flicking through the pages, I was mesmerised by this ever so simple yet glamourous silk sheath dress. I’m not exactly sure what drew me to it. It could have been the distinct low V-neck or the way it gracefully hugged her silhouette. I just loved its simplicity and I felt inspired. My afternoon chill out session soon ended and I found myself in the sewing rooms creating a pretty gold crystal hair comb. I was like a woman possessed and I had to make something! I’ve also been meaning to create a crystal hair comb in gold for quite some time so it was the perfect opportunity. I love how the gold sparkly hair comb turned out and I think the navette and round shaped Swarovski rhinestones worked beautifully together. I love designing and creating, it brings me to my happy place. 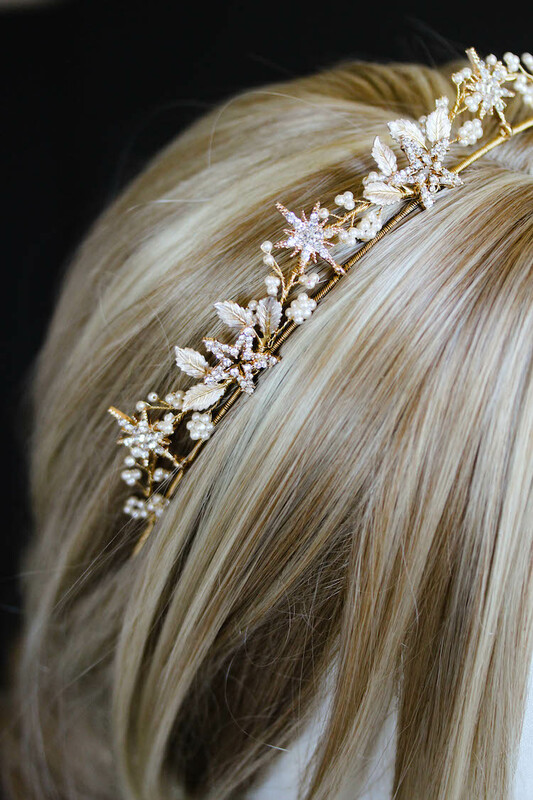 If you have a gorgeous wedding dress but you aren’t sure about how to accessorise, why not get in touch and ask about a bespoke hair accessory? I’d love to hear from you!